The annual Analytics India Salary Study presented by AIM and AnalytixLabs, now in its fifth year, is the only study coming out of India that digs deeper into salary trends to give a comprehensive view at how analytics salaries have changed over the years, skills that are very much in-demand and the hiring challenges it could present. Our report looks at the distribution of average salaries across years of experience, job category, region, industry, education, gender and tools and skills. All in all, we expect to see another busy year for analytics hiring market. Data Analytics professionals are currently benefitting from the big data wave with analytics professionals earning 26% higher than an average software engineer in India. 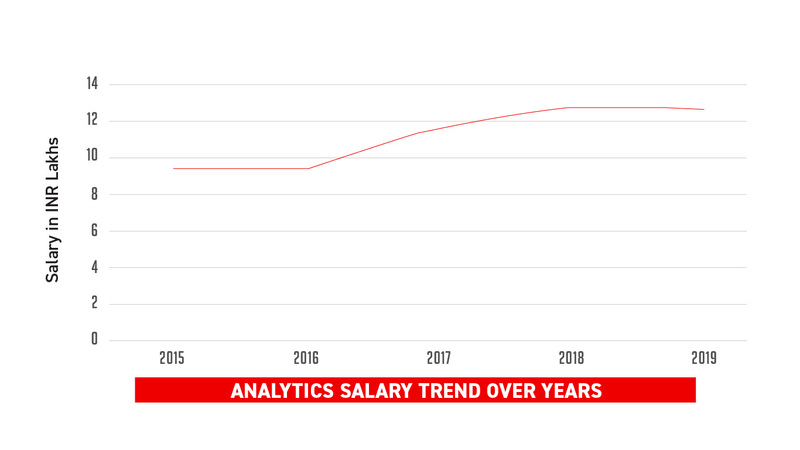 Now, similar to last year, the average salary of analytics practitioners has remained steady across all experience levels with the remuneration remaining unchanged. However, the demand for mid-level professionals with median compensation of INR 6 lakh onwards has surged, demonstrating that analytics as a function in India Inc has become more mainstream with enterprises capitalizing on growth opportunities. What we have observed is that over the last three years (2016 to 2018), there has been a pronounced growth in median salary across all experience levels, increasing from INR 9.5 lakh in 2016 to INR 11.7 lakh in 2017 and touching INR 12.7 lakh per annum in 2018. However, this trend has levelled off with the average analytics salary capped at 12.6 lakh per annum across all experience levels in 2019. 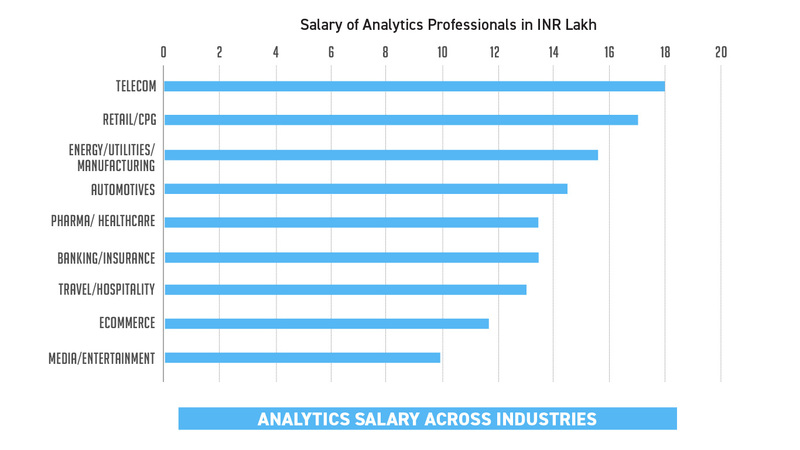 A high point is that analytics salaries continue to exceed other software engineering roles with analytics professionals out-earning Java counterparts by almost 50% in India. The study also found a 1.8% increase in salaries of entry-level analytics professionals with experience between 0 to 3 years. It is also clear that Big Data and Data Engineering professionals who work primarily on unstructured data continue to earn more than analytics professionals. Our research also confirms the observation that organisations data scientists with a PhD and they also lean towards candidates from elite engineering institutions. Salaries in a city is a function of two factors- the demand for a skillset and the relative cost of living in that city. While Bangalore & NCR has the highest demand for analytics professionals, Mumbai is India’s most expensive city. Hence, Mumbai is the top earning location followed closely by Bangalore. The rest of India, Hyderabad & Chennai is much lower showing a marked distinction in salaries between cities. Chennai & Hyderabad are the lowest paymaster at 10.7 Lakh & 10.3Lakh respectively. In the 0-6 Lacs bracket, Chennai dominates other cities with 40% of Analytics professionals earning below 6 Lacs followed closely by Hyderabad at 39%. 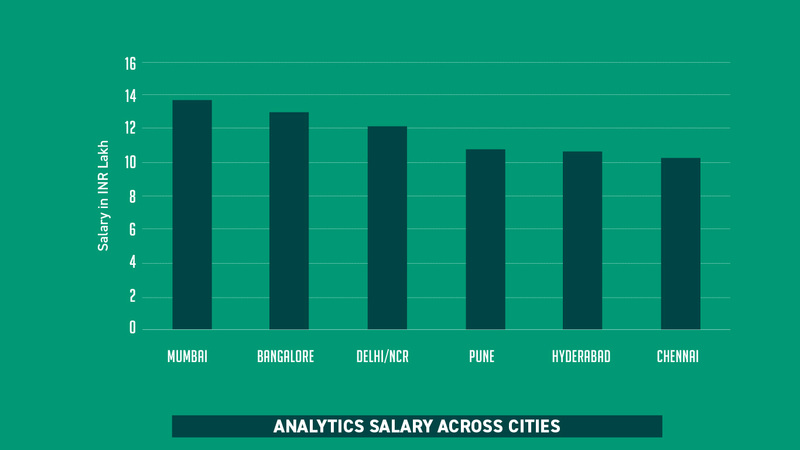 Among the metros, Hyderabad saw the highest annual increase in median salaries for analytics professionals at almost 5% — from 10.2 Lakh in 2018 to 10.7 Lakh this year. Salaries across experience levels is a critical factor to judge how the industry rewards seniority. Experience Levels could also be seen as designation like analyst, manager, director etc, but we chose to look at the number of years in the industry. This is a more quantitative assessment and can resonate easily with senior folks. With more and more enterprises setting up dedicated analytics practice, the number of high-profile appointments have gone up. Beefing up the senior leadership stack is not just limited to enterprises but also high-growth startups like OYO and Swiggy that are hiring senior talent to architect a global strategy and push growth. Those transitioning to upper management can expect a 60% jump in their salaries. 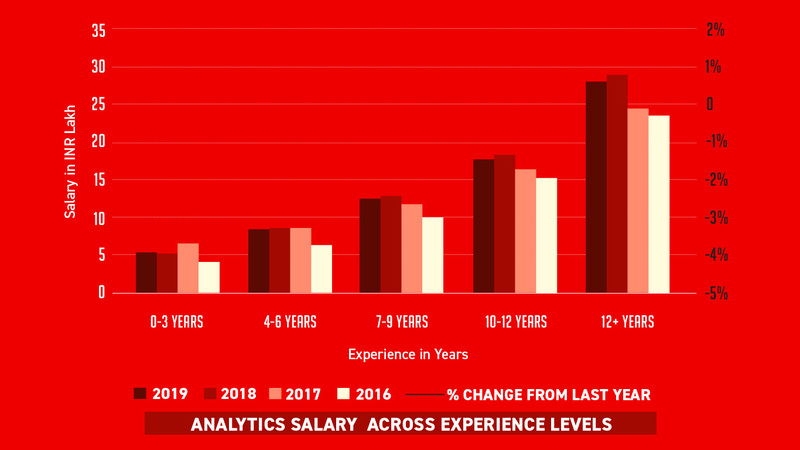 Analytics salaries saw a slight increase at the entry level (0-3Yrs experience) this year – from 5.2L median last year to 5.3L per annum. Salaries within an industry is affected by broadly two indicators — the rate of adoption for that technology within that industry and the relative value that the industry garners from the technology. What we have observed is that more and more enterprises are morphing their traditional businesses into data driven companies to succeed in the competitive market. A higher adoption rate would signify a relative stabilization of resources and processes which in turn would cause a dip in salaries. 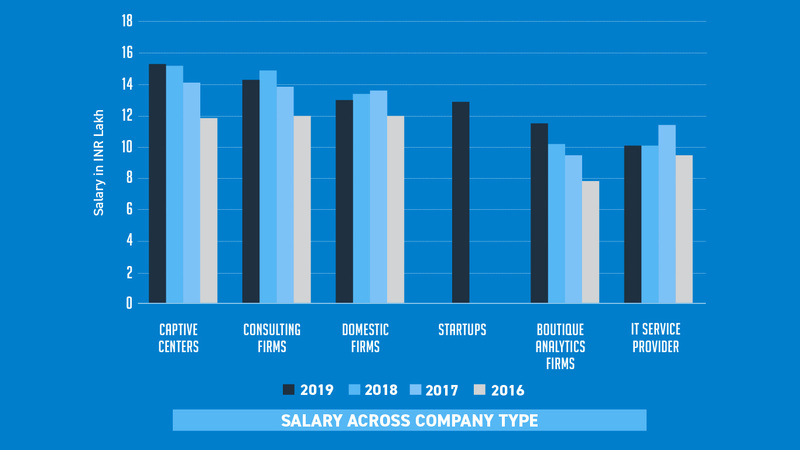 Industries that have recently adopted analytics would also see a skew towards higher senior level professionals vis-à-vis other industry, thus pushing the median salaries higher. We have seen a marked increase in global corporations launching full-fledged analytics unit across a wider spread of sector. Among the industries that value Data Science the most is telecom that has the highest median salaries at 18 Lakhs, while Media & Entertainment vertical offers the least median salaries for analytics professionals at 10 Lakhs. This is a very wide range (higher variances) in terms of median salaries. For eg: Banking sector was one of the earliest adopters of analytics in India. 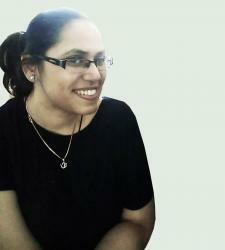 It is also by far the biggest recruiter of analytics professionals in India. 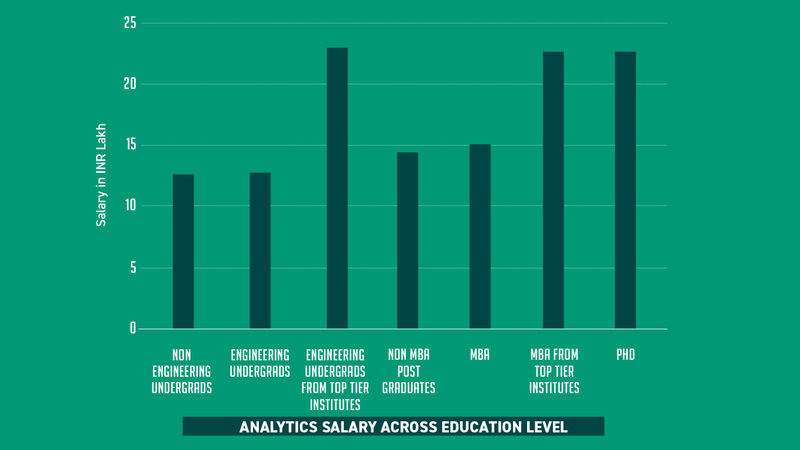 The salaries in Banking for analytics professionals currently stands at the lower spectrum in median terms. Eventually, this salaries variance across industries should reduce as adoption increases over time. 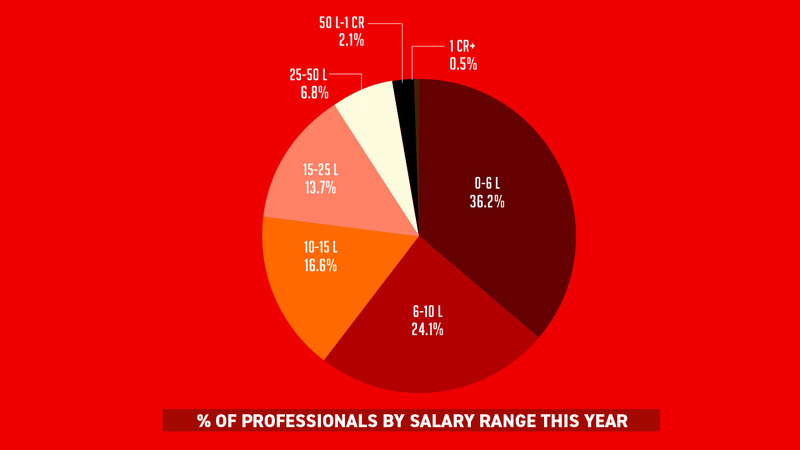 Media/ entertainment industry pays analytics professionals the lowest with median salary of 10 Lakhs. E-commerce sector has the highest increase in the salaries of analytics professionals, at 4% – from 11.2% in 2018 to 11.7L this year. 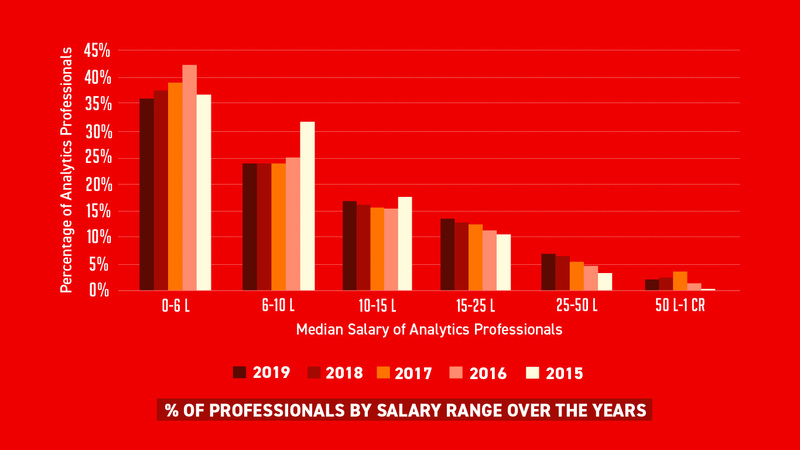 Media/ Entertainment has highest decrease in the salaries of analytics professionals, at 4.2% – from 10.3% in 2018 to 9.9L this year. One of the most critical factors for the increase in salary expectations for an analytics professional would be an advancement of skillset. With companies moving data to the cloud, big data tools like Spark, Hadoop and Scala are becoming more popular. This requires candidates with experience with big data platforms and in order to secure this talent, enterprises are willing to offer a higher payscale. As organisations experience an unexpected increase in data, their need for highly-skilled Big Data professionals and Data Engineers grow and have become the most in-demand resources. Big Data Engineers, Data Engineers and Data Scientists now form the bulwark of data science units and organisations willing to invest in top big data talent to maximise its business potential. As a result of this, we have seen a growing demand for these professionals but salaries remain steady as more and more professionals enter this field. 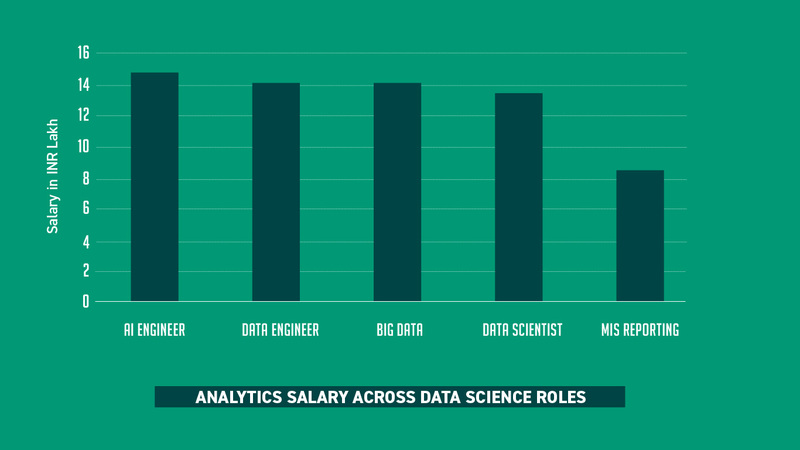 In the data science talent stack, analysts and BI experts command the least pay package. Essentially, five types of organizations recruit data scientists in India and it is important to look at salaries for all these company types. Firstly, captive centers are Global Inhouse Centres (GICs) for large MNCs setting up operations in India. Analytics forms one of the core areas that these captive centers work on. Secondly, Consulting firms (Big 4 ) also provide analytics consultancy and this can be either to domestic market or to the global clients with delivery centers in India. Thirdly, we have seen a surge in domestic Indian firms like Reliance and Bajaj Electricals setting up analytics unit for enterprise wide adoption. Fourth, large IT service providers have setup analytics competencies and provide services to global clients around analytics. Lastly, we have observed a rise of domestic analytics boutique firms providing specialised services to clients. This year we included startups in India to list. These include large new age well funded firms like Zomato, Swiggy, Paytm, Ola, Urban ladder etc. As per our data, a premier institute credential is equivalent to a PhD in India. Will data scientists with PhDs outearn candidates with a Masters, certainly, but even though there is a huge demand for PhD candidates in data science, data scientists with a PhD currently form only 1% of the analytics workforce. On the other hand, a specialization from leading premier institutes (IITs) can fetch candidates a 22 lakh onwards package. This trend clearly denotes that data scientists from India’s elite engineering institutes can earn a base salary of 22 lakh while those from second-tier institutions earn a package 12 lakh. Also, the contribution of a Master’s degree is significant, given that almost 60% of analytics workforce in India has it and 7% of workforce is from premier undergrad or postgrad institution. Also, there is a demand for professionals who have some sort of formal training, reiterating the need for upskilling. Similar to 2018 study, the data points to a huge discrepancy in salary by gender, with women analytics professionals earning 50% less as compared to their male counterparts. The pay gap has widened as compared to 2017-2018 research wherein the respondents surveyed reported earning 32% less vis-a-vis men in the same company. While the pay gap is even more pronounced this year, average salaries commanded by women over the last two years remains steady. On median, women data scientists command a salary of 9.2 L whereas male professionals command 13.7 Lakh. It is a well-known fact that gender pay disparity exists in the analytics field and women participation in STEM has been very low. 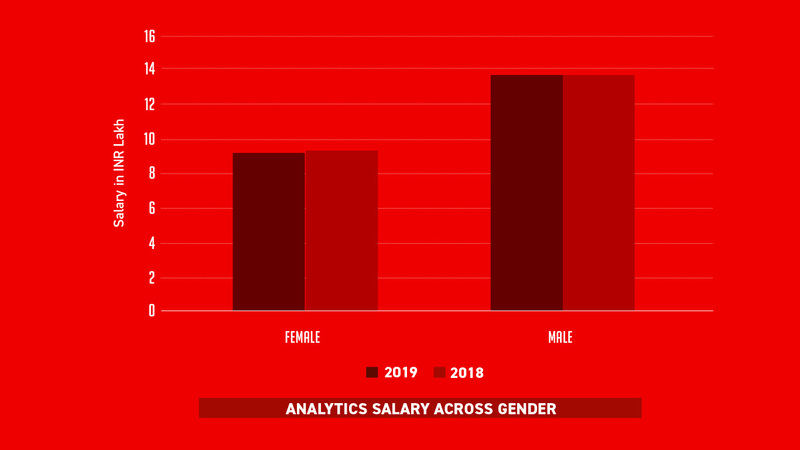 Given how analytics is related to coding and mathematics, women salaries are evidently less from male analytics professionals. Over the last few years, there have been concerted efforts from the industry to increase women representation in the analytics field and close the gender pay gap, however we are yet to see any improvement in this area. 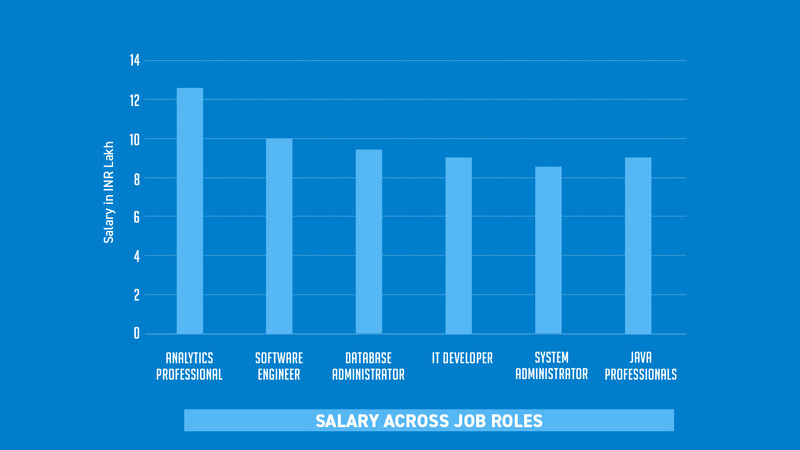 Python commands the highest salaries among analytics professionals – 15.1 Lakh as median. R, Tableau, SAS & SPSS saw a decrease in salaries compared to an year ago. SPSS saw median salaries decreasing by almost 4%. India has emerged as one of the key regions when it comes to growth of Data and Analytics technology with demand for data scientists and analytics professionals booming. Governments, for instance, in Karnataka, Telangana and Andhra Pradesh are heavily investing in its start-up ecosystem, and we are seeing a rise in new-age companies — the data natives of India — Oyo, Ola, Freshworks, Byju’s, Swiggy, Zomato, Paytm entering the unicorn club. These high-growth companies are now applying data to business models and strategies in innovative way and driving the talent market with niche analytics roles. To cater to their demand, premier Indian universities and edtechs are now offering specialised courses and Master’s programmes in Data and Analytics, Machine Learning & AI. It will be interesting to see the talent emerging from these institutes and how it will shape the analytics market. Another trend that will dominate the hiring market is that in order to secure top talent, enterprises are willing to pay top dollars and open doors to talent specialised skill-set. And while the heavily regulated Telecom sector continues to be the major employer of analytics, e-commerce segment also requires data scientists and are willing to pay above market rate to drive growth and innovation. All in all, the year 2018 represented a year when digital transformation reached a peak and we saw enterprises showing an increased understanding of the value of data and how it is sharply co-related to revenue and profitability. This also underscores that senior management is investing more in their strengthening their existing analytics functions. Now, the challenge lies with professionals and key stakeholders to upskill, take a leap of faith and find new, exciting roles and work with data-driven technologies.